Beirut: In his first reaction to Israel’s weekend airstrikes, President Bashar Al Assad said Tuesday that Syria is capable of facing Israel, but stopped short of threatening retaliation for the attacks near the Syrian capital of Damascus. 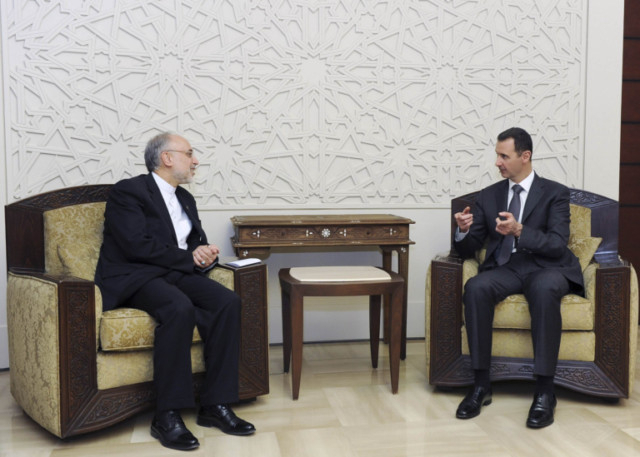 Al Assad spoke after a meeting with Iranian Foreign Minister Ali Akbar Salehi, who paid an unexpected visit to Damascus. Iran is one of Syria’s closest allies. “We are fully confident that Syria will emerge victorious from the crisis,” Salehi said. However, Israel’s airstrikes on Friday and Sunday put Syria and Iran in a difficult position because they would run the risk of drawing Israel’s powerful army into the war if they retaliate. At the same time, inaction further weakens Al Assad’s already shaky claims to being the leader of the Arab world’s hard-line, anti-Israeli camp. Israel has not formally acknowledged the strikes, but Israeli officials have said they were targeting shipments of advanced Iranian weapons possibly bound for Hezbollah. The officials have said the aim was to deprive Hezbollah of weapons, not to raise tensions with Syria. Israel has largely stayed on the sidelines since the uprising against Al Assad, which erupted in March 2011, turned into an armed insurgency and finally a civil war. On Tuesday, Al Assad said Israel is supporting terrorists, a reference to the anti-regime rebels, and that Syria is “capable of facing Israel’s ventures”. He did not say what action he would take, if any. Salehi adopted a slightly harsher tone, saying that “it is time to deter the Israeli occupiers from carrying out these aggressions against the peoples of the region.” He also stopped short of threatening retaliation.